This is a moving ballad that wonderfully compliments BoA’s voice. Partly written by the singer herself, bittersweet would be a choice word to describe it. While the arrangement boasts strings and bells for the most part, a few touches of piano here and there add a little more simplicity and really tie things together. This song is so much different from any of the Japanese material BoA has ever produced because of the raw emotion present in the lyrics and arrangement. Instead of the generic “I love you, I’ll always stay by your side blah blah” crap we normally get, this song shows growth in a positive direction because of its expression of sadness and nostalgia, at the same time with little hints of hope. This is quickly growing to become one of my favorite BoA songs because of the new direction it’s taking her in, at the same time remaining true to her style. I can’t really pick this song apart and find anything wrong with it. It’s a pleasure to listen to on repeat over and over again. “soundscape” returns to the older sound that we’re used to hearing from BoA. The combination of guitar, chimes and a hip hop beat is reminiscent of her earlier work. This almost sounds like something you could have picked off of her “LOVE & HONESTY” album, updated, spiffed up, repackaged and put on this single, not that that’s a bad thing. To be more specific, if “OVER ~across the time~” and “Kokoro no Tegami” had a baby, they would probably name it “soundscape”. This song is by far more enjoyable than any of her more recent b-sides because it’s not an experiment or something new that her producers are testing out, it’s pure BoA in every way. Finally a classical version of something! I think I have been waiting for way too long for something like this, and here it is, coupled with two other awesome songs. The arrangement of this version of “Everlasting” is a lot quieter, but in no way is it of less quality. The clear presence of strings give it more of a sophisticated feel and even though BoA’s vocals were not re-recorded, they don’t sound intrusive or overbearing. They still mesh perfectly with the orchestration. However, like most orchestral versions of songs, I feel that this version lost some of the magic of the original version. Overall, it’s an enjoyable song, but nowhere near as wonderful as the first track. This could easily be called one of BoA’s best singles to date, due to the quality of the songs and also the relief it provides after a few unsuccessful singles. After the mess called “make a secret” and the so-so white noise of “Dakishimeru”, “Everlasting” is a refreshing burst of renewal. Even if it’s not selling too well, this is still a wonderful single to listen to. 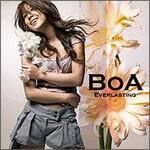 Due to the mediocrity of BoA’s previous two singles, fans everywhere were nervously biting their nails (including myself), not knowing what to expect when “Everlasting” was announced. However, this fantastic single has definitely proven everyone wrong. Out of all that experimentation, it’s still possible to produce something that’s thoroughly enjoyable and well worth the money.